“Climate science” is an area of relentlessly shifting claims, predictions, and threats. Hundreds of bizarre, apocalyptic claims have been made by governments and government-supported scientists pursuing the catastrophic-manmade-global-warming-by-CO2 theory. 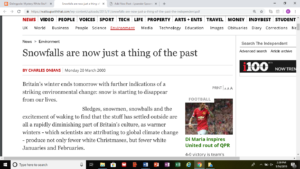 Now the innovative journalist James Delingpole reports that the most ludicrous “news” article in the history of London’s Independent newspaper–the March 2000 article with the headline “Snowfalls are now just a thing of the past”–has been “mysteriously erased” from the Independent’s online archives. While worldwide snow cover varies from year to year, overall snow cover has been increasing over the past 10 winters.